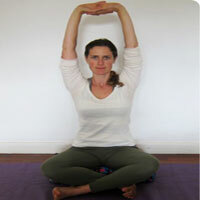 Garbhasana pose is used to relax the body and calm the nervous system. Garbhasana pose is a forward bending movement and extremely calm to central nervous system. If you are interesting to practice yoga Garbhasana pose, you can start with come down to mat on hands and knees. You sink the hips back onto feet and fold forward at hips. The hands come down in front of you and your forehead touches the floor. You are also can move hand to your sides with the palms facing up, still keep forehead on the floor. You can start take some experiment with both variations and notice the differences. It is advisable to allow your tailbone to lengthen down towards the floor. The spine feels very long. If you need some support, place a pillow or bolster under your front body. You can stay breathing deeply in and out of your nose for at least three minutes. It Allow the body to sink into the posture more deeply with each exhale. By this pose, it can notice the changes in the body and mind from when you start and complete the posture. You are able to allow the sensations feel at the end of the posture to resonate inside of you for few minutes. It is recommended to move slowly out of the pose and into your day and it can carry calm and equanimity within your day. It is very important to train the kids with yoga. 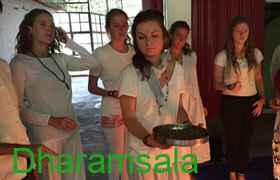 Learning and practicing yoga for kids at yoga training course is the best options to choose. Professional yoga teacher teaches the kids to develop their body and mind. Yoga for kids is an excellent way to build strong connections of mind, soul and body. Yoga for kids is a good way to improve breathing system that make your kids get more oxygen and improve blood circulation as well. Yoga for kids is a great way to help kids grow properly and healthy. Professional yoga teacher teaches your kids in proper exercise. When you are learning yoga for kids in yoga training course, your kids will learn about breathing technique, tree poses, candle poses and downward facing dog poses. The breathing technique is an excellent way to start calm down of nerves. The technique leads your kids to take deep breaths, make them clam of mind. The Garbhasana poses are an exciting fun. The kids will teach about balancing technique with one foot. The tree pose help kids to grow the body. The candle poses is a great exercise to improve upside down position. The downward facing dog pose is a great way to develop limbs of yoga and build strength of body. There is some basic yoga for kids available at yoga course. The professional yoga teachers always know and understand anything they need to develop of mind and create high concentration. 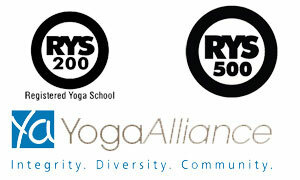 Yoga for kids is an excellent way to develop relaxed in complex homework in your kid’s life.